BASIS™ mass flow controllers offer repeatable, reliable gas flow control in a compact, economical package for high-quantity orders. 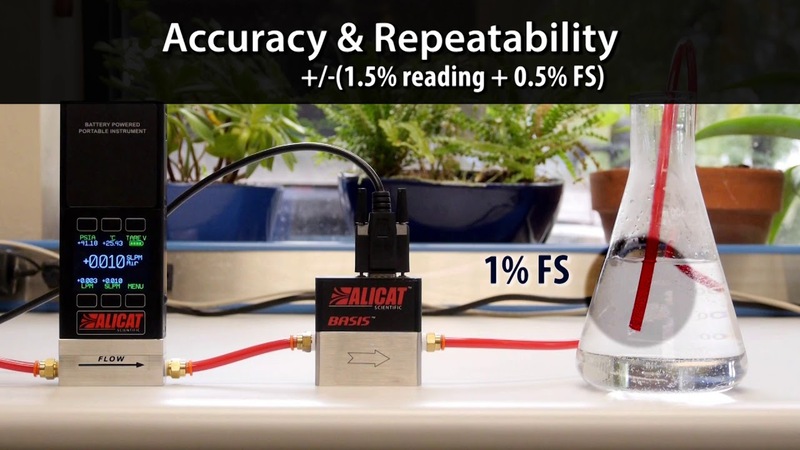 Designed for stress-free integration within original equipment manufacturer (OEM) products, BASIS features a small footprint, high-accuracy MEMS sensor and Alicat’s leading fast valve control. Reliable. BASIS controllers won’t let you down. NIST-traceable accuracy and repeatable control ensure that your product works the same on Day 700 as it did on Day 1. Responsive. Pressure spikes won’t ruin your day. Industry-leading control speed and PD valve tuning lets BASIS mass flow controllers get ahead of the unexpected. Compatible. Do more with BASIS controllers. A small footprint, calibration for multiple gases and dual analog-digital communications give your team greater design flexibility. Ensure measurement accuracy in OEM analyzer products. Fast valve response and high accuracy make for repeatable and stable gas flows to the analyzer sensors. Small size, instant control readiness and dual communications make BASIS easy to build into end user products. Fill your gas mixing cabinets with responsive BASIS mass flow controllers that are ready in an instant for flow measurement at full accuracy. Fast analog and digital feedback to a PLC or PC allows real-time changes to the flow rate setpoint to maintain desired gas mixture composition.